There are a couple of dive sites around this island ranging from beginner to more experienced depending on current flow. The west side is predominantly hard coral from the surface to the sandy bottom. 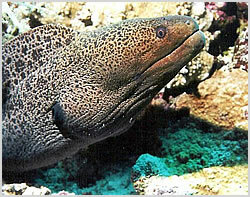 Moray eels can be found on close inspection hiding in crevaces in the rockface. The southern end of the island is spared the current but marine life is also in less abundance and the north offers a sandy expanse ideal for training. Probably the best dive site on Koh Sak (Horseshoe Island) is the eastern side facing Pattaya. There are a number of concrete cubes at exactly 10m depth. Following them on a due south heading you can hop from cube to cube in a drift dive. Turtles and stingray abound, also lookout for giant pufferfish here too.